Heiko Flottau’s review, with the headline “The Decline of Liberal Zionism,” dealt with American author Peter Beinart’s book, whose title in German translates to “The American Jews and Israel. What is going wrong,” and German TV journalist Werner Sonne’s book “Raison d’état? Germany’s Liability for Israel’s Security.” The article appeared in the prominent paper’s July 2 edition. The representation of a female figure carrying food to a monstrous beast lying in bed reminded me of illustrations to Little Red Riding Hood. 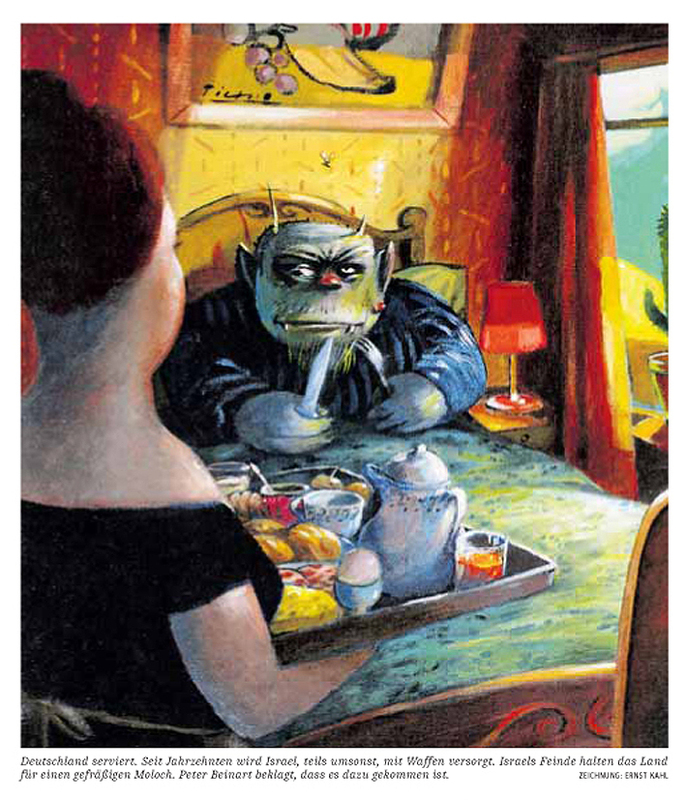 The reference to a ‘Moloch’ in the caption also helps suggest that the horned troll, brandishing his knife and fork, may be casting his greedy eye on the girl as well as the tray she carries. This is an evasive statement. Yes, the picture itself, in its original context ‘has nothing to do with anti-semitic cliches’ but, in conjunction with the review and caption, it clearly taps into antisemitic tropes, in particular the blood libel. (One strand of the blood libel is the claim that Jews worshipped Moloch, the false god who demanded child sacrifice). and, although the article is behind a pay wall, a glance at the opening suggests that the writer has jumped at the opportunity, courtesy of Beinart, to explore ideas which are somewhat taboo in Germany. A later statement, published on Wednesday, is rather more apologetic in tone. However there is still an emphasis on readers’ perceptions, on ‘misunderstandings’. I would imagine that not all readers of Engage are great fans of Peter Beinart. However when I first read the story I found it hard to imagine he would approve of the use of this offensive (in context) picture, and I was glad to have this assumption confirmed. There is plenty of room for debate about appropriate responses to hate speech in a range of contexts. People might not want to censor Holocaust denial or crude racism on a personal blog, while having zero tolerance for comparatively subtle expressions of antisemitism from elected representatives. Here Robin Shepherd and Mike Whine offer eloquent, but opposing, perspectives on the French Court’s recent decision to identify antisemitic tweeters. The issue here is not about creating UK law to ban Holocaust denial. It is about having companies publish their terms of service and then holding them to those terms. It is about requiring a response in reasonable time when a complaint is made. It is about transparency of process. It is about actively working to prevent not only a spread of racism but a spread of hate more generally including tackling problems such as cyberbullying. With these things in place, adults can decide if they accept those terms and can decide whether a social media site is appropriate for children under their care. OHPI’s report offers helpful, precise analysis of why certain images are antisemitic, including examples which focus on Israel, and conflate Zionism with Nazism. This is a form of antisemitism identified in the EUMC working definition – which OHPI is urging Facebook to adopt. The screenshots at the end of the report demonstrate Facebook’s tendency to fail to (fully) recognize the hateful nature of some images and ‘jokes’. I largely avoid Facebook, so am not sure how consistently it polices racist and other hateful content more generally. If it aims to have a zero tolerance policy for such matters it should certainly adopt OHPI’s recommendations. Whatever one’s views are about freedom of expression, it is reasonable that Facebook should set its own standards and implement them consistently. In particular we commend Facebook for the new approach to pages which implements our suggestion that page owners be prevented from hiding behind the anonymity a page provides when they post hatful content. The new policy means content that falls short of hate speech (which would require removal), but is nonetheless hateful, must either be removed by the poster, or they must associate their profile with the page that makes the comments. This is done by optionally listing the account of the page administrators on a page’s about tab. There are other areas where Facebook seems to be failing to comply with its own policies and processes too – here’s a recent piece on double standards with regard to images of sexual violence. Even if one would not want to see any of the (hateful) material highlighted in OHPI’s report banned outright from the internet, it seems reasonable for a social networking site to establish and maintain high community standards and take expert advice if it is not equipped to determine how to implement its own policies. Israel Apartheid Week is an unconvincing masquerade of an annual Palestine solidarity event which aims to indoctrinate students against Israel. It is known for violence and threats against Jews and Israelis on campuses, and a growing number of voices are calling it part of the problem. The Jewish Chronicle reports that a member of Stand With Us was physically attacked as he challenged the delegitimation of Israel at a public event. You see Hanzala a lot at these events – I’m picturing him watching the Israel advocate get bitten, wishing Palestinians had better advocates. That’s what university campuses are for. Update: more at Harry’s Place. CST has long been known for recording and analysing antisemitic hate crimes: the physical assaults, desecrations, racist abuse and hate mail that make up a quantifiable measure of antisemitism. But just as, in recent years, it has become increasingly apparent that antisemitism is not restricted to the activities of street thugs and bar room racists, so it has become necessary to chart that other sort of antisemitism: the ideas, images and language that occasionally pollutes public discourse.